Master cylinder performance/suitability is all about bore and stroke. If the bore is the same the same foot/leg effort will produce the same system pressure. Increasing the stroke increases the volume - meaning a greater pedal travel. Increasing the bore decreases the pressure for a given input effort. Compare the cylinder measurements and make a decision that way. I've used e36_323ti's formula to size my brake upgrade and give more rear bias to my car bringing it closer to E36 M3/Z3M stock bias. At least if you plug in the M3 fronts and 328/Z4 rear combo you can see how that compares to the stock bias. Thanks spidertri, that is one of the threads that I have been searching on the site. At this point, since I have the M3 M/C I think I will just run it and see how it goes. I am waiting on the SRS adapters and a few bushings to finish of the rear suspension refurb. I'll post up my take on the set up once I get everything together. Until then, if anyone else has any other personal experience with this or similar setups I would be glad to hear about it. Thanks!! I found the spreadsheet I made to calculate brake bias and plugged in the numbers for the parts you want to use. 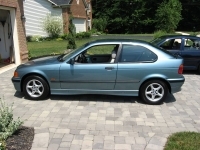 It should be fine, stock ti parts put the static front bias at 66.6%, stock E36 M3 is 61.2%. Your setup should be at 63.8%. So it doesn't move the brake bias further forward which you definitely don't want, moving it rear a bit is a good thing in my opinion. Make the rear brakes do a little more of the work. WOW.... Dave, thanks for the help in confirming this, I appreciate it! I will report back in a few weeks with how it works/feels. It is kind of surprising to me how well the stock brakes work in normal driving and I feel that if I did not already have these parts a regular E36 328 vented set of fronts would work well for this. Thank you again for the help. I'll keep this post updated.